This month I had some help picking a topic to focus on- a fellow doctoral student at the University of Louisiana at Lafayette had approached me about doing something together and then suggested bats as a topic. To be specific, she suggested white-nose syndrome, and I agreed with her for several reasons: first, bats are sometimes seen as scary or dangerous, so it’s good to look at how they fit into ecosystems and even benefit us; second, bat conservation is a pretty large issue, so being able to narrow down a bit is helpful when it comes time to gather information; and third, white-nose syndrome is a big problem for cave-dwelling bats in the Northeast, especially, and, even as it spreads from population to population, researchers are still trying to figure out how best to stop it. My knowledge of white-nose syndrome, or bats in general, is pretty limited. I have a little experience with capturing bats both in the US and elsewhere for research, and I did have the opportunity to care for a few injured bats while I was in Texas, although typically we would stabilize the animals and then transfer them to a bat-specific facility (I have to say they were pretty relaxed customers- very few wild animals are as willing to be hand-fed). I have also seen bats flying at dusk from time to time (or, in my personal favorite memory, hitting the hat of my brother as he sat fishing off the back of the boat and nearly scaring him into the water). They seem like remarkable and fragile creatures- I find their aerobatics pretty amazing (some were so adept at getting around or through the strings of the harp trap!) and I love the fact that some species live in massive colonies. I know that some bats are very good at eating insects, particularly swarming ones (like gnats), so I definitely appreciate their help in keeping the bugs away. What I know about white-nose syndrome is as follows: researchers started noticing higher mortality for bats coming out of hibernation with whitish fungus on their faces; it seemed to be passed from bat to bat while roosting together in caves; and it seemed to be spreading from cave to cave in the Northeast. Bats that are afflicted with white-nose syndrome seem to come out of hibernation earlier and use up their stored energy before enough spring food becomes available, although maybe the order is the other way around. Although this fungus exists in Europe as well, it does not appear to be causing the same issues over there, so North American bats are at the greatest risk. 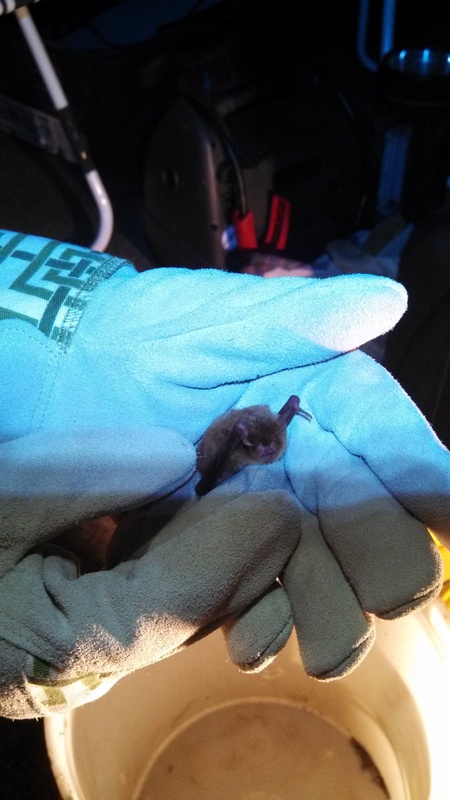 This month my goal is to get a better sense of how white-nose syndrome is impacting bat populations, how it is being spread, and the ways in which we can combat it. I’d also like to support a balanced view of the role bats play in the environment- I’m sure they could use a little good press. And I’m very excited to be collaborating with others to present some of this information- hopefully we can put together something that is both informative and engaging. So it should be a pretty interesting month- stick with us as we investigate white-nose syndrome and the ways we can support bat populations.